Here are a few “Doggy Links” my Mom found and that she reads. I hope they help you too. PetPlace.com – A very useful site for all things Dog related. Also send out a daily newsletter. Drs Foster and Smith – We buy things for Dexter from this site. Also have lots of good advice. Rottweiler – The Wikipedia page all about the Rottweiler Breed. Xalan Rottweiler – Dexter’s Breeder, Shaheem Effendi. Shaheem breedes Roittweilers with a wonderful temperament. 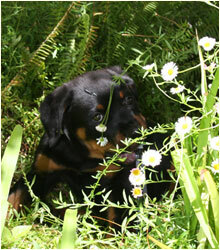 Dexter is a confident, happy and healthy example of Rottweilers from this breeder. http://www.dogworld.co.za – Dog World South Africa – The dog site for show people, the show site for dog people. Some links about the City I live in, Cape Town. A List of 101+ things to do in Cape Town – lots of places to take dogs for walks including non-dog related outings. http://www.cape-venues.co.za/ – Lots of places to stay in Cape Town as well as Western Cape accommodation. Pet-friendly in Cape Town – When we go away for weekends my Mom checks this site to see if I can go too and when we go to other places in our country we look here South Africa Pet Friendly. KwaZulu Natal – Accommodation options at Hotels, Bed and Breakfasts, Guesthouses, Apartments and Self Catering Suite accommodation in KwaZulu-Natal, including Durban, Pietermaritzburg, Natal Midlands, the Drakensberg and the greater KwaZulu Natal Province. Rouge Day Spa – My friend Ox’s Mom’s Day Spa!